Contains natural dried mealworms that chickens absolutely love to eat. 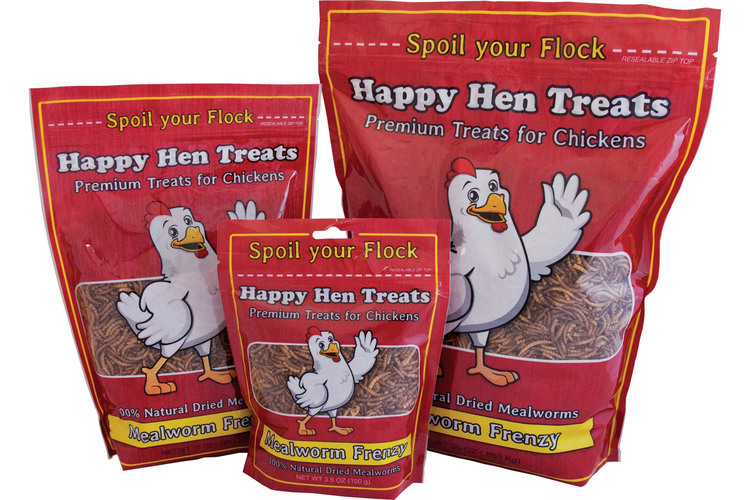 Dried mealworms offer chickens the taste they love without the inconvenience of storing and handling live worms.Available in 3 sizes (3.5 oz, 10 oz, & 30 oz). Contains natural and healthy ingredients that chickens absolutely love to eat. Choose from 3 tasty options: Mealworm & Corn, Mealworm & Oat, and Sunflower & Raisin. 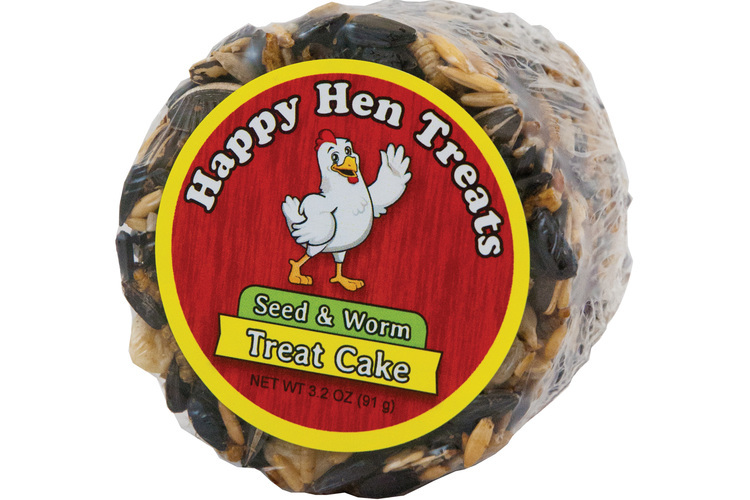 Happy Hen’s tasty Seed & Worm Treat Cake provides a nutritious snack while reducing boredom and pecking! By hanging the Treat Cake and letting it swing, your chickens will have a blast trying to taste all the different flavors. This 3.2 oz cake contains a blend of seeds and mealworms that your chickens will love. Your chickens will go wild for this Mealworm & Sunflower Treat Square! 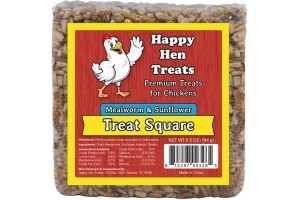 This 6.5-oz treat square is all natural and uses ingredients like mealworms and sunflower kernels that chickens enjoy, ensuring that they eat every delicious morsel. 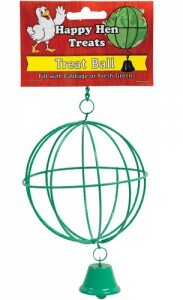 Chickens will look forward to being cooped up when they have a fun Treat Ball to play with. Chickens can enjoy pecking away at cabbage, lettuce, fresh fruits, or any other healthy treats that you can pack into the treat ball. (4″ diameter) Color may vary. Happy Hen Treats— “The World’s First Treats for Chickens”— were the inspiration of a seven year old girl named Kassidi, who raised chickens in her backyard in a small town just outside of San Antonio, Texas. During a trip to the pet store to purchase treats for the family’s dog, Kassidi asked her father if she could also buy treats for Bailey, her favorite chicken. As her father gently explained treats were not available for chickens, he saw that his explanation was not setting well with Kassidi. She insisted on searching thestore in hopes of finding something special to take home to Bailey. Less than a year later, Happy Hen Treats developed Mealworm Frenzy and declared it to be “The World’s First Treats for Chickens.” Thanks to one little girl’s vision and determination, chickens across the country can now enjoy a special treat developed especially for them. Because so many others share Kassidi’s passion for raising and caring for pet chickens, Happy Hen Treats continues to expand their line of quality products made specifically for chickens. 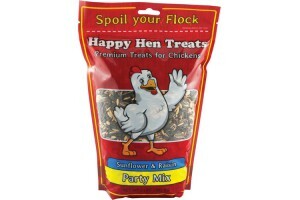 Find Happy Hen Treats and everything else you need to “spoil your flock” at Russell Feed & Supply. Heaters, waterers, coops, bedding and, of course, a wide variety of poultry feeds for all stages. We have new chick varieties arriving weekly at stores; please check our Event Calendar for arrival dates and chick types. This entry was posted on Monday, May 4th, 2015 at 12:48 pm	and is filed under News & Updates, RFI News. You can follow any responses to this entry through the RSS 2.0 feed. Both comments and pings are currently closed.